Even the most efficient engine wastes a lot of the energy it produces in the form of excess heat. But thanks to a little quantum trickery, we can reclaim that heat...and maybe help save the ozone layer in the process. We already have devices that convert heat into energy, like refrigerators and steam turbines. But those have complex mechanics and moving parts, which make them less than ideal for catching the waste of other types of engines, and some of them require ozone-depleting chemicals known as chlorofluorocarbons. The trick is to create a molecular thermoelectric device, which can harvest waste heat without any need for moving parts. "Thermoelectricity makes it possible to cleanly convert heat directly into electrical energy in a device with no moving parts. Our colleagues in the field tell us they are pretty confident that the devices we have designed on the computer can be built with the characteristics that we see in our simulations. We anticipate the thermoelectric voltage using our design to be about 100 times larger than what others have achieved in the lab." Their device works by placing a pair of ultra-thin electrodes around an equally tiny rubber-like polymer. All together, this nanomaterial would only be a millionth of an inch thick, making it easy to coat the exhaust pipes of cars or factories with the material. The material harvests waste energy thanks to the laws of quantum mechanics, making it one of the first pieces of energy technology dependent on a field generally reserved for theorists. The quantum mechanical property the researchers seized upon is wave-particle duality, in which subatomic objects like electrons behave like waves or particles depending on the situation, and are essentially both at once, as counter-intuitive as that seems to us in the world of classical physics. In this case, it's the wave properties of electrons that matter. The rubber polymer features lots of tiny molecular rings, and electron waves split in two and "flow" along either side of the ring whenever they encounter them. The team specially designed the rings so that it would take the wave traveling along one side of the ring slightly longer to complete its journey than the other wave, causing them to be out out phase with each other when they meet again on the other side of the ring. 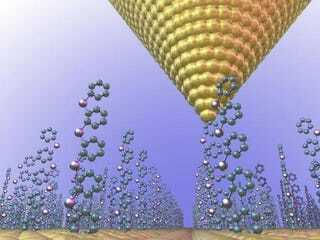 "You could just take a pair of metal electrodes and paint them with a single layer of these molecules. That would give you a little sandwich that would act as your thermoelectric device. With a solid-state device you don't need cooling agents, you don't need liquid nitrogen shipments, and you don't need to do a lot of maintenance. The effects we see are not unique to the molecules we used in our simulation," Bergfield said. "Any quantum-scale device where you have a cancellation of electric charge will do the trick, as long as there is a temperature difference. The greater the temperature difference, the more power you can generate." "Solar panels get very hot and their efficiency goes down," Stafford said. "You could harvest some of that heat and use it to generate additional electricity while simultaneously cooling the panel and making its own photovoltaic process more efficient. With a very efficient thermoelectric device based on our design, you could power about 200 100-Watt light bulbs using the waste heat of an automobile. Put another way, one could increase the car's efficiency by well over 25 percent, which would be ideal for a hybrid since it already uses an electrical motor."